The Pier to Forever: Enjoy Chapter Three of Unsmited--a Fan-Fiction Tribute to The Lord of the Rings! Enjoy Chapter Three of Unsmited--a Fan-Fiction Tribute to The Lord of the Rings! Sauron is dead; the poisonous dark fume over the land is lifting; and the Orcs have been smited--swallowed up by a vengeful earth that held them in hateful contempt. All but one, that is. This is his story. So did the Orc findeth rest and raiment, food and drinketh. And new friends. He turned over. He instantly wished he hadn’t, and turned back. The sun was in that direction. Though Tia’s home was in high forest, the sun still peeked through the boughs and through the drapes and into his eyes. Even though they were closed, it was still too bright. He grunted angrily. They put him in her room after showing him the washroom and bathroom, and after cleaning his wounds and binding his injured ankle, elbow, knees, and hip, and after feeding him. He had watched in astonishment as the very earth opened and swallowed his kind as the Great Eye of Sauron crumbled and exploded and was gone. Lightning flashed and the lava mountain exploded … and there were the humans, unharmed! It was as though the gods had judged the whole of Orckind! The humans stood there—unharmed! How did he survive? Why did he survive? The questions gnawed at him incessantly. So did another: Was he the last Orc left alive? He asked Andylyr. She looked up from her work wrapping his ankle and shook her head sadly. They fed him after he washed. They let him sit with them at his table and treated him like one of their own. He ate with his hands and did his very best to control himself and to keep the food from splashing them or getting everywhere. The meal was delicious, and he marveled that such was so. It was as though his Orc innards had developed a sudden taste for it! As the light drained from the forest and the hearth warmed the home, Krapp felt drowsiness like a heavy blanket cover him. Tia and Andylyr helped him to Tia’s room and laid him down on her bed. He had always heard about human beds—how soft they were, how comfortable, how warm. Orcs had always laughed in derision about it. It spoke to humans’ great weakness and softness. The great Orc Commander Shtrack proudly slept on rusty nails and had his corporals assault him twice nightly with hammers. He pissed over cliff edges in high winds and leaned his huge arse over open fires to take a dump. If he got burned, he yelped in delight. That was the standard all Orcs were to aspire to. Krapp had found it way over the top. Tia and her mother covered him and left him in peace. He was asleep before they closed the door. The light in Tia’s room was too bright now that it was morning, and so he rose. He looked down at Tia’s bed, and then bent closer. Though he had washed the night before, he was still so dirty—as were his threadbare clothes—that he had left an imprint of his person on her clean sheets. An Orc wouldn’t care about such things. Or would one? If he was the last one left alive, so blessed by the gods who had extirpated the rest of his kind, then it stood to reason that the gods wanted him to care, as he was doing right now. In any case, the little human’s bed was a mess—and he was responsible for it. Did it matter now that Orcs wouldn’t have given it even a moment’s notice? He very likely was the entire Orc race now. He would decide what Orcs did or didn’t do! He opened the door and went to the kitchen. He looked out the window over the basin. Tia was in the garden tending it. She was humming. He listened with an empty smile on his face. Smiling. For Orcs it was a reflex action reserved solely for moments of barbaric cruelty and joyous malevolence, not for moments of innocent sweetness. It was enough to shake him from his reverie. There was fresh water in the basin; he went to dip his face in it and drink his fill, but stopped. Humans used cups. There was one next to the basin; he grabbed it and dipped it in and emptied it in two gulps, then did it again, then again. He put the cup down as Tia began a new song. He could smell food—but it was nowhere to be seen. He was very hungry. Instead of tearing the house apart, as he wanted to, he stepped outside and went to his new friend, who beamed up at him from her work. It was only then that he became aware of it: his injuries … were gone. All of them! His knees, his ankle, his hip, his back … It was as though he had never been hurt! She squeezed him tighter. Unsure what to do, he put his arms around her and held her back and blankly considered the miracle of his newfound health. “I feel … I feel … better,” he rasped absentmindedly. He ate ravenously. Tia watched him, fascinated. When he finished, which was in just a handful of seconds, she hurried to get him more. She returned with his plate piled twice as high as before and sat excitedly and waited. He stared at the food, then at her, then at the table and the floor. There was food on both. He dug in again, but with the brakes on, as he had the previous evening in the presence of the human mother. He swallowed a handful of fried potatoes and glanced at her. She reached and wiped his chin. He stared at the cloth. He took it from her. There was a design on the cloth: a house in a forest. Another cruelty-free, nonviolent smile formed involuntarily on his mouth. He felt it rise and curiously fingered his mouth with his free hand (the other was still gripping potatoes). She jumped up and hurried to the pantry and grabbed a smaller plate, which she loaded with potatoes. She returned and sat down. As he ate, she did too, and just like he did, ravenously with her hands. “Poo … pee.” He nodded unsurely. They stood and left the house. The light of the day was oppressive, but the trees’ shadows kept it from become unbearable. Behind the home was a corral. A horse waited in the enclosure, eating grass. It spied him and lifted its head and watched him. Orcs and horses did not get along. If a horse spied an Orc, it generally snorted and galloped away, or, as with warhorses, charged. Getting on one was impossible. Hell, getting near one was! But this one, only scant feet away, did nothing but continue to stare at him. With an indifferent grunt it lowered its head and continued eating. Was he even an Orc now? Had something happened to him that changed him forever, that made him utterly unique from his kind? He gazed down. Tia stared up at him with concern. He gathered his wits and nodded without conviction. A horse … like an Orc? He took a couple uneasy steps forward. Shygar lifted his head, his mouth working steadily on long strands of hay. He took another step forward, then two more. He was within touching distance. With great caution he reached and touched the stallion’s nose. He had always wondered what horses felt like. Now he knew. He couldn’t keep the smile off his face, or a tiny squeal of delight from escaping his mouth. “Magnificent …” he said again. The horse whinnied contentedly and went back to eating. But not before lifting its tail. 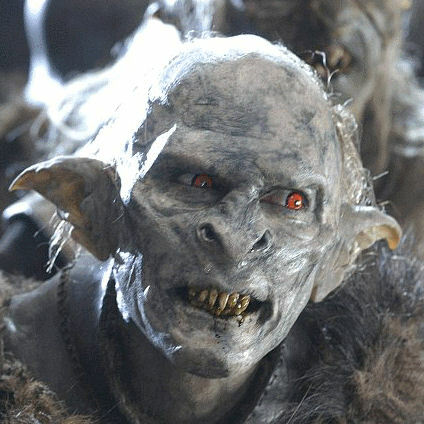 He tried to explain that Orcs didn’t have to “poo” or “pee” all that much. When she asked how much, he tried thinking. He thought for a long time, then hesitantly nodded. She gazed at him and then punched his arm. It wasn’t hard, but it surprised him. He stared. Andylyr was at the kitchen table, where she set down a large cloth bag stuffed full. She gazed at Tia, who rushed up for a kiss, and then at Krapp. Krapp approached her. He gazed at the bag. Andylyr opened it and started pulling out … clothes? Shirts and pants, a belt, even shoes! There was a hat; it was stuffed in so tight that it had deformed. Before he could touch it Andylyr took it and punched it back into shape, then handed it to him. He took the hat—it had a very wide brim and pleasant contours on the top, and was made of leather—and tried putting it on. His ears got in the way, and so merely balanced on the tops of them. Tia held up, then squealed with laughter. “Oh, that’s really cute! Oh Krapp!” She ran to him and threw her arms around him.